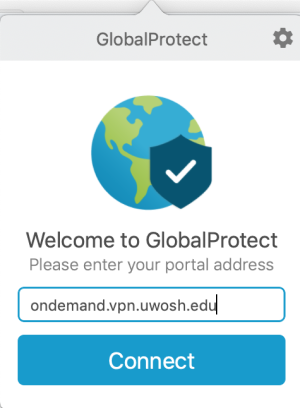 GlobalProtect can be installed to provide VPN access to protected campus services while away from campus. You must request access to use the VPN, see VPN - Requesting Access for details. Follow this procedure to install and connect the GlobalProtect agent software. You may need to reboot your Mac for installation to complete. After installation is complete you can proceed to connect following the below instructions. 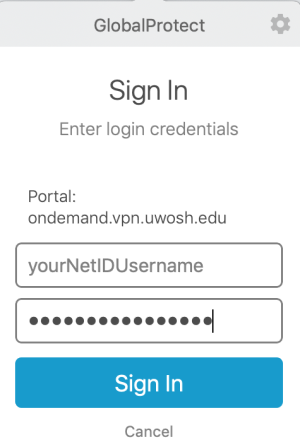 Once installed, connect the VPN to establish a secure connection to campus. Click the GlobalProtect icon at the top of the screen. 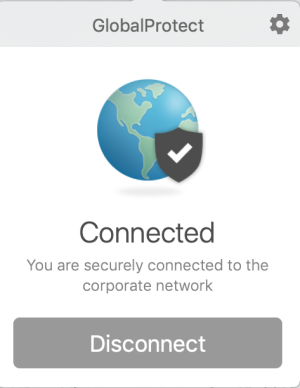 The GlobalProtect icon looks like a small globe. Click Connect to begin the connection process. When prompted, enter your NetID username and password. You are now connected to campus and can access protected resources. Once completed with your work, click the GlobalProtect icon and click Disconnect.